The epic made simple. The miracle in the mundane. One day, while browsing an antique store in Helena, Montana, photographer Tyler Knott Gregson stumbled upon a vintage Remington typewriter for sale. Standing up and using a page from a broken book he was buying for $2, he typed a poem without thinking, without planning, and without the ability to revise anything. 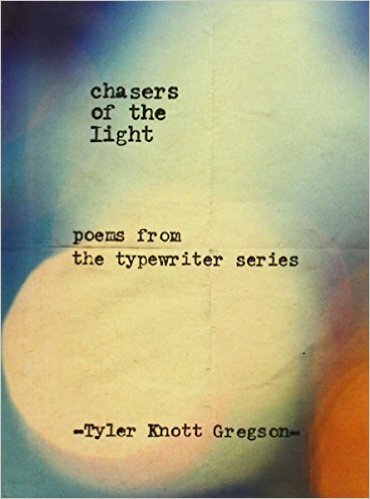 Three years and almost one thousand poems later, Tyler is now known as the creator of the Typewriter Series: a striking collection of poems typed onto found scraps of paper or created via blackout method. Chasers of the Light features some of his most insightful and beautifully worded pieces of work—poems that illuminate grand gestures and small glimpses, poems that celebrate the beauty of a life spent chasing the light. Poetry was my first love. The first writing I ever did? Song lyrics in the third grade that I eagerly showed my teacher even though I had no musical ability — which was confirmed when I spent all of middle and high school in band and could barely be bothered to memorize my sheet music. I chose the French horn because my band director said "smart" kids played the French horn, even though it turned out my plump lips made it harder to get out those high notes on that teeny tiny mouthpiece. I still have notebooks in my embarrassing giant storage bin of writings I've asked my friend Connie to burn in the event of my untimely death. At least a couple of them are from my gen ed humanities course in college, where I spent most of the time mining Greek and Roman history for metaphors for my romantic and existential predicaments. Because I'm an unsophisticated, sappy sort, gimmicks draw me in. Which is why I was so drawn to Chasers of the Light by Tyler Knott Gregson when I went to Barnes & Noble on a poetry hunt. The book comprises poems written with a secondhand-store typewriter on found paper — no take-backsies, just unfiltered stream of consciousness. I read the bulk of it the week I watched Weepah Way for Now three times (I have a thing for Aly Michalka), so clearly I was in a wistful, sepia-toned mood. On receipts, on boarding passes, on photographs, on blank pages of used books, Gregson (Knott Gregson?) writes the most earnest love poems imaginable. Like I've said before, the line between crap and quality in poetry is completely subjective from my perspective. And I really loved this. The poems in this book are sappy and loaded with cliches. Granted. But they're so touching and real. They were clearly written in the throes of true love. They're the kind of poems you slip in notes to someone you're courting. The kind of poems you write in your journal. The kind of poems you whisper snippets of in a lover's ear. "An ocean/ of/ difference/ exists between/ making love/ and/ being made by it." "I/ have blisters/ on my/ feet/ from dancing/ alone/ with your/ ghost." "I want to hear you stir from sleep/ and listen to the sheets/ as they whisper of your rising." Because of the typewriter conceit, this collection manages to walk the line between hipster pretense and complete absence of pretense. Aesthetically, the typewriter font on torn, aged paper is gorgeous. And emotionally, the theme of worshipful love hits me right in the feels. This book is SO romantic I can't get enough of it. This unvarnished vulnerability is exactly what I look for in art, and I value it over any practiced craft. Tyler is a Montana photographer who has two golden retrievers named Calvin and Hobbes and studied Eastern philosophies in college, so, yeah. Swipe right so hard you break your thumb. This might not win any awards, but I think it's definitely worth your time. I'm your go-to girl for book recommendations because I read a little of everything, from YA fantasy to romance to graphic novels. This blog is my attempt to tackle my TBR list while piling on to yours! Want to chat or request a review? Email me at girlfridaylit@gmail.com. Share book reviews and ratings with Liz, and even join a book club on Goodreads. Origin story: "Jessica Jones: Alias Vol. 4"